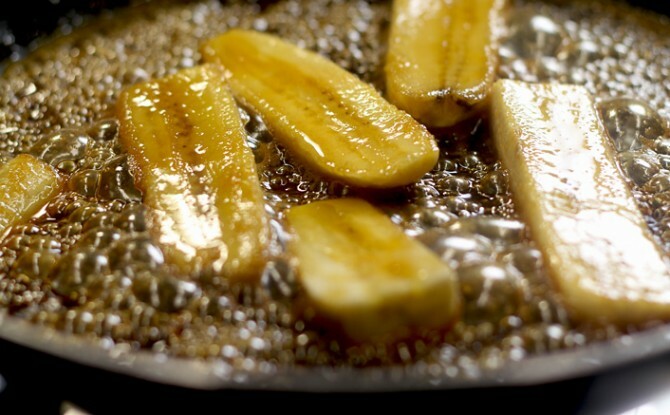 Melt some butter in a heavy based frying pan, add 4 bananas cut lengthways and cook on a gentle heat for 20 minutes until they soften. Sprinkle with dark brown sugar and a good pour of RUM JUNGLE and allow to caramelise. Wrap the bananas in pancakes and drizzle with the caramel sauce. To serve top with an extra slosh of RUM JUNGLE and enjoy with ice cream.